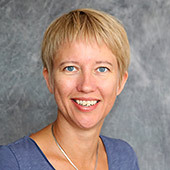 Eva Wirström is a Senior Researcher and Division Head for the Onsala Space Observatory division. Her research interests includes the physics and chemistry in the giant clouds of gas and dust forming stars and planetary systems in our galaxy, as well as the link between these and the emergence of life - astrochemistry and astrobiology. As senior researcher she works on the Science team for one of the instruments bound for the Jupiter system in ESA's JUICE (JUpiter ICy moons Explorer) mission, the Submillimetre Wave Instrument (SWI). SWI will be used to observe the thin water atmospheres of Jupiter's largest moons, connected to Eva's previous work on interpreting data from the Herschel Space Observatory, which observed the water content in many different kinds of space environments. Eva's research is funded by the Swedish National Space Board. There might be more projects where Eva Wirström participates, but you have to be logged in as a Chalmers employee to see them.